Thanks to everyone helping out over the weekend. Andy does all the tedious donkey work behind the scenes, but the event simply couldn’t happen without everyone’s quiet excellence on the day! 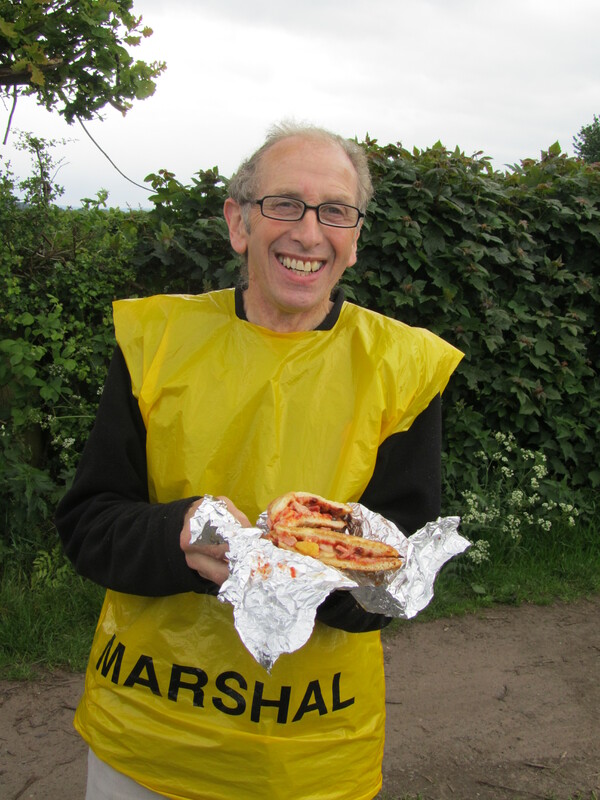 The comments we get back after the event make it clear that the marshalling and organisition are one of the reasons that make the event so special. There’s still time to put your hat in the ring if you can spare even a few hours on the day (nothing compared to the 12h+ some people will be putting in!). Contact Andy Robinson. The day dawned sunny and clear, not a cloud in sight. The hottest day of the year so far. 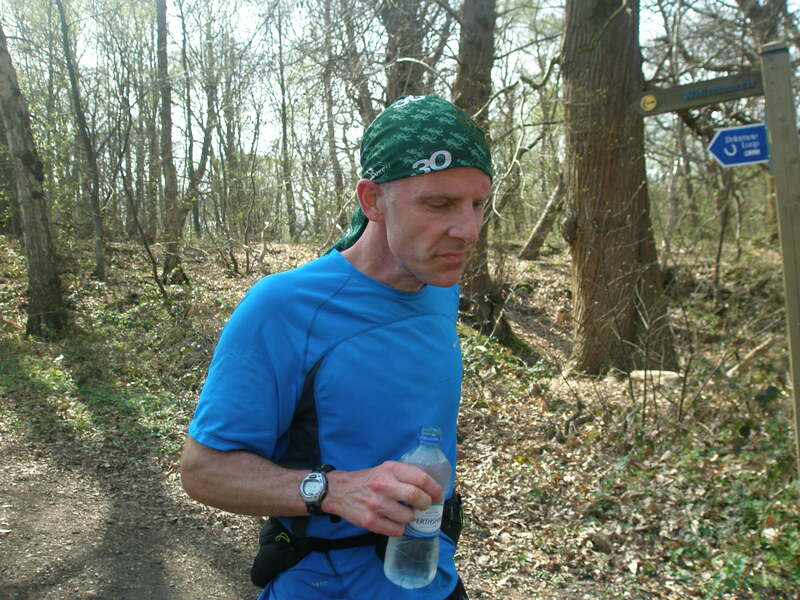 A good day for heading to the beach or alternatively to Whitchurch for a 34 mile trail run. Nice easy running for the first 3.5 miles following the Llangollen canal. Plenty of Good Mornings to the friendly folk on the canal boats as they passed through the locks at Grindley Brook. This part is definitely the quickest the GPS told me that I had broken 7 minutes for the only time on the run. Willey Moor Lock Tavern is looking very inviting, the tables and chairs being set out for the customers to enjoy a leisurely pint whilst watching the barges pass. Before temptation becomes too much the trail takes a sharp left over the fields. The next section of the trail is probably the most dangerous. I survive the first hazard by remembering to take the short diversion round the paddock containing the man eating llama. Then I sneak through the farm where rumour has it the occupant is not always friendly to people crossing his land. Luckily no sign of farmer or his dogs. First and only Swallow of the day was perched on the telephone wires just after the Cheshire Wildlife head quarters at Bickley Hall farm which seemed an appropriate place for it. Running going well on the very firm ground. Only muddy part of the whole trail was caused by a leaking pipe near a cattle trough. I keep going subsisting on my gourmet trail runners diet of new potatoes, High 5 Gels and copious amounts of water. Next landmark is Michael Owens racehorse stables at Manor House Farm. No sign of the great man, suspect he may be at Aintree. Plenty of racehorses about though. Not long after this it’s on to the hills at Bickerton, skirting round the wood then heading upwards to Maiden Castle. First of many cracking views across the Cheshire plain out towards the Welsh border. 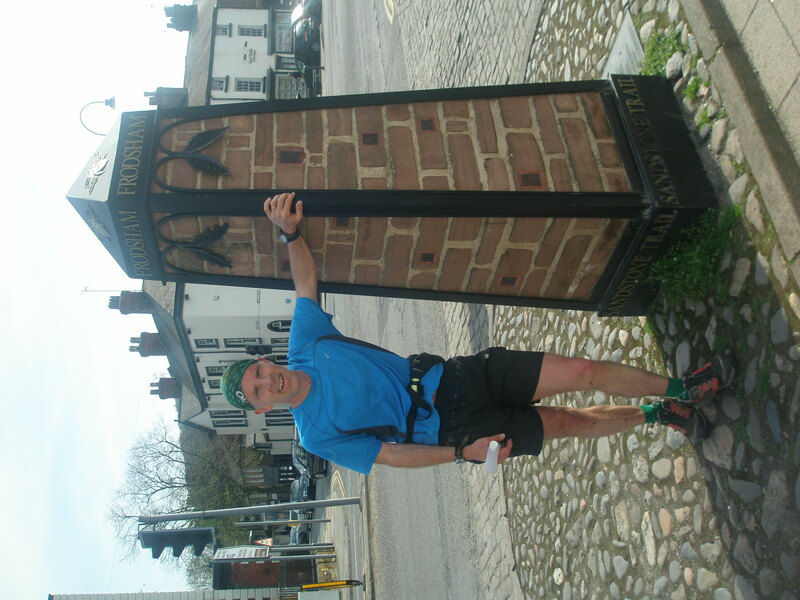 On familiar territory now having done the longish Sandstone trail race several times. Really enjoying the running with the hills providing a welcoming breeze preventing overheating. Drop down from Bickerton only to head straight back up to Rawhead, the highest point on the trail, don’t stop to take in the superb views but keep on running. Then it’s down from Rawhead across the fields and up over Bulkeley hill. Several big parties of walkers out enjoying the excellent day. Queuing behind one party there is mention of the Pheasant at Burwardsley. This excellent hostelry is only a short distance down the road, but like the last pub the trail turns off before temptation becomes too great. Heading down the track towards Beeston Castle I make a quick call to ensure the support team are in place with supplies. They make a welcome site when I arrive there 10 minutes later. 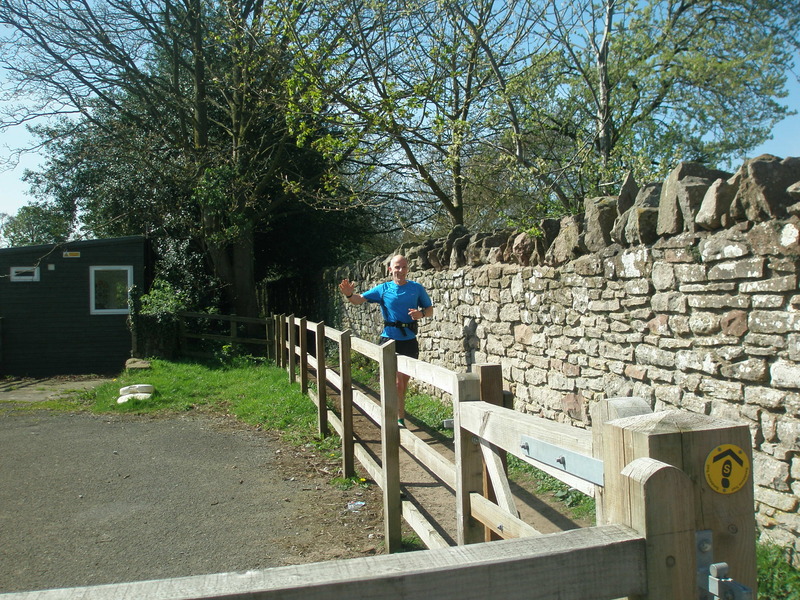 Waving to the support crew at Beeston Castle. Lunch consists of a banana, some Jaffa Cakes, a lot of water and a very welcome 5 minute rest to eat them. Things going well so far. The half way point has been reached in a shade over 2 hours 30 Minutes and I’m still feeling good. Remind myself this is the easy part, just a long Sunday morning run really and the hard bit is yet to come. Steady progress is made across the fields North of Beeston despite getting a bit of stitch for the first few miles. Now I’m back down to the Cheshire plains the temperature is warming up. Luckily I have that most useful of items a 30th Anniversary Four Villages Buff to prevent sunburn. Things are getting tougher as I hit the hills again heading up towards Rock Farm and the pace is definitely slowing. Meet a group of lads on the Cheshire hike resting at the top of the first hill and they are well impressed by the fact that I ran up the hill. 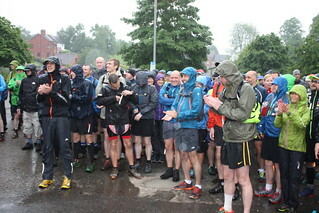 Even more impressed when I mention that I started the run in Whitchurch. Encouraged by their support I head on up the hill beyond Rock Farm. A steady plod for the next few miles sees me approaching Delamere Forest. Another quick call to the support crew to check they have made it to Barnes Bridge Gate Car Park. Unfortunately due to a slight miscalculation on time they aren’t there yet, but luckily they are not far away and make it just in time. More water is taken on board but don’t feel like food this time. By coincidence this point is pretty much equivalent to a full marathon in distance. Happy to have got to this point in 4 Hours 10 Minutes. Legs starting to seize up now so after a very short rest head off before they do. 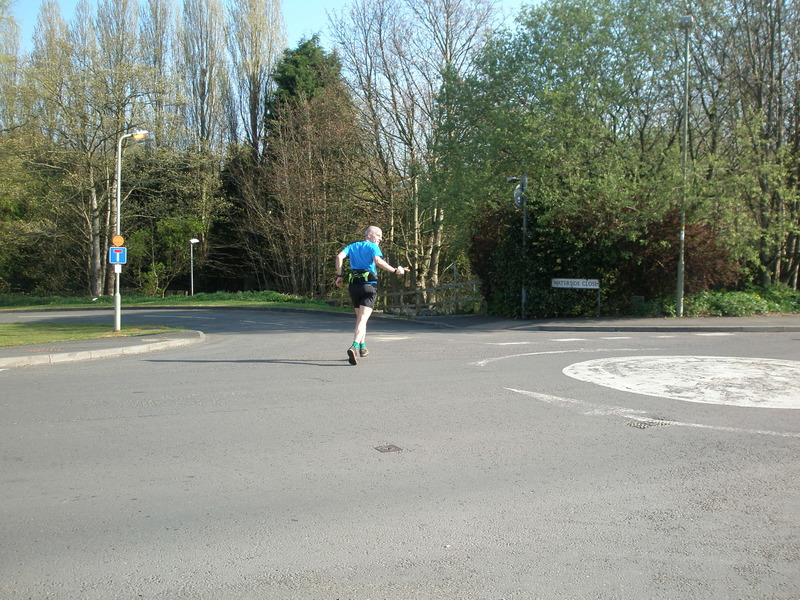 Now things start to get tough, pace drops to a very steady plod but keep running. Next rendezvous with support crew at Manley School. Grab some more water and keep going. Down the road at Simmonds hill then back to the fields. Pace dropping further and already looking forward to the next rendezvous at the Ridgeway. It’s only at this point that you realise how valuable support from a friendly face or two keeps you going. Suddenly I am surprised and exceptionally pleased to spot a very familiar figure with a Baseball cap running towards me. 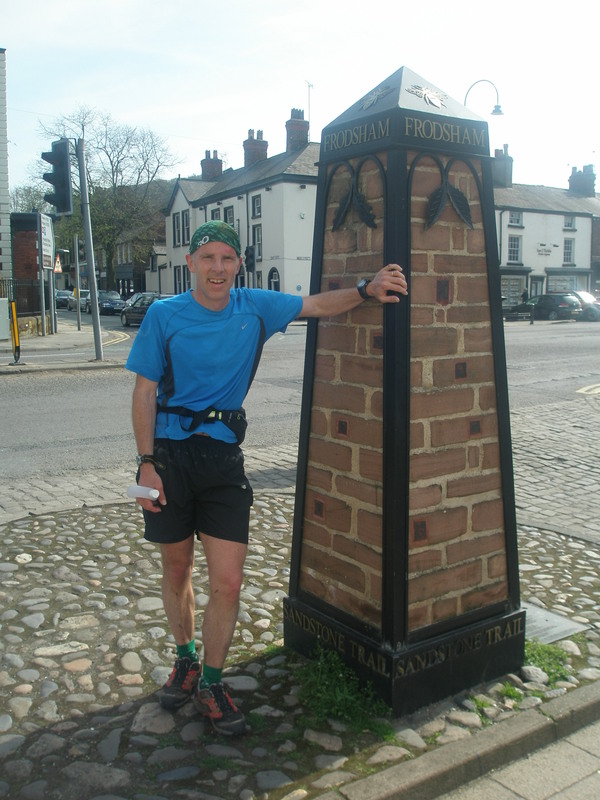 Adair after completing the Llantysilio fell race only an hour or two earlier has come out to find me on the trail. He then proves invaluable running with me and giving me lots of words of encouragement. 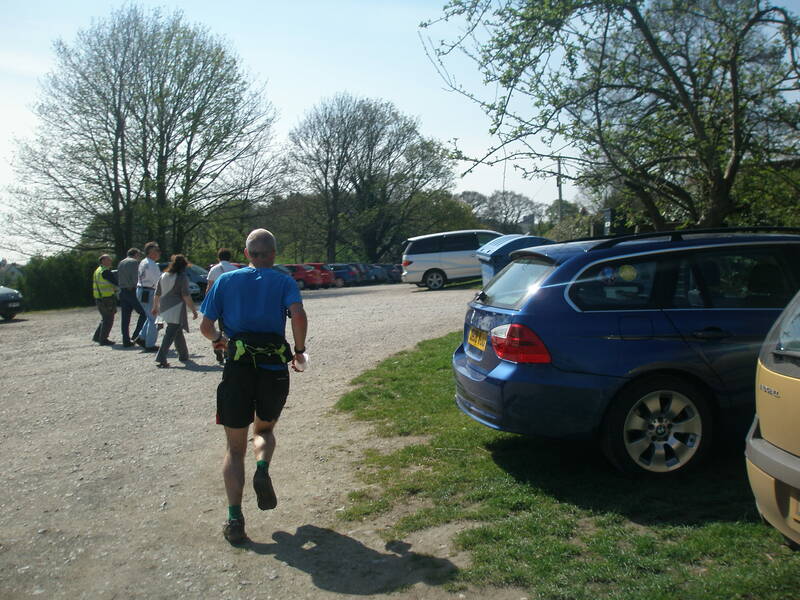 Then follows what was for me to be the hardest section of the run, the trail up Woodhouse Hill. It feels like someone has added an extra couple of miles to this bit. Will the top never arrive? Eventually it does and start to follow the ridge towards Frodsham. Get asked how far I’ve come by a couple of walkers as I stagger up the steps at Jacob’s ladder and when I tell them they give me some words of encouragement. Every little bit helps at this stage. Heading onwards being careful to look out for tree roots as I’m getting very tired now. Looking ahead I spot the last climb before Frodsham memorial and what a bonus I get here. The Club’s number one supporter is waiting to meet me. I shouldn’t be surprised that Joe has turned up to make sure I get to the finish. 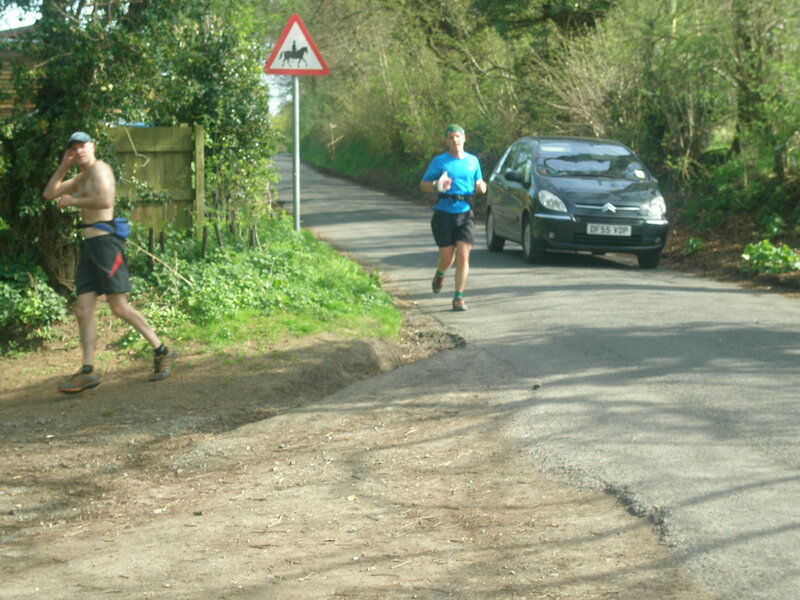 As I crest the hill and start the descent into Frodsham I realise that someone is starting to catch me up and on turning the corner at the first zig zag I realise that Joe is running down the hill. This inspires me to keep the pace up so I don’t get passed by a “super vet”. Hit the road section in Frodsham and although tired I know I’m nearly there. Somehow this knowledge helps my pace increase slightly. As I drop down past the Church. The high Street is looming ahead and when I reach it Adair leaves me to head back up the hill to Joe. Only a few yards to go now. The town seems quiet; perhaps they are all watching the Grand National. Across the main Road, dodging the shoppers. Narrowly avoid a car turning into Morrison’s and there in front of me is the Bears Paw. Still tired but recovering well, legs not too stiff yet, maybe tomorrow. Very pleased to have done it in under 6 hours, not quite as fast as Chris or Adair but not far off. But I am in awe of the time Mario did on the old fire station race route, 4 hours 20 minutes. Looking forward to marshalling the race on 21st May, I will certainly have respect for all those competing. 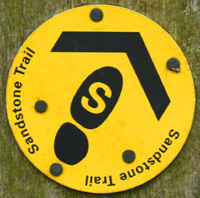 Sandstone trail challenge Sat 21 May – help needed! 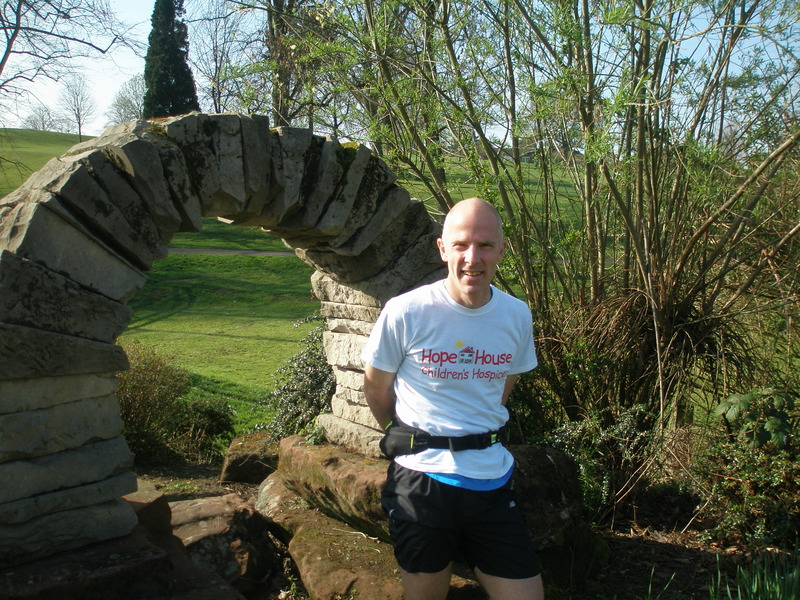 We need volunteers to help us on the day of the Sandstone Trail Challenge event that we’re organising in May. We need around 20 people, the majority to man the checkpoints between Whitchurch and Frodsham, but also we’ll need help in other areas, such as ferrying retired participants back to Frodsham Community Centre, and help at the Community Centre. The event will be low-key compared to the 4 Villages, but will go on all day. I expect to be at the Community Centre at about 5am and not to get home until 11 at night, but apart from the core team we’ll schedule everyone else who helps for reasonable shifts. Please let me know if you can help out – we need you to make the event a success.